In the last session I attended at this year’s Gamer Camp Benjamin Rivers spoke about how the way we interact with games and with others while playing games has changed over the years. Similarly in looking back at this year’s Gamer Camp I think there has also been a dramatic (and awesome!) shift in the way the event has flowed and developed this year over last. Having attended last year’s Gamer Camp I was like an impatient kid on Christmas Eve waiting for this year’s Gamer Camp to arrive and I definitely wasn’t let down. Starting from just an idea between Jamie Woo and Mark Rabo in fall 2009, this year’s Gamer Camp which occurred on Nov. 13 and 14 grew to become not only much bigger but also very different. While keeping with the original format of Gamer Camp 1 on the first day I have to say that the addition of Day 2 was the most exciting. Set in the school of design at George Brown College the whole event was really opened up for attendees to explore and interact with the speakers and each other. Rather than a linear list of speakers, everyone in attendance was able to go from session to session or even not go at all having free reign to check out the classic game emulators, indy gaming cabinets or even just taking time out to interact with other game players and creators. In the end I think this new format encouraged something that most people came to experience which was having an opportunity to just talk about games with fellow gamers and with the Toronto developer community.While gaming has become for the most part mainstream, having an opportunity to talk passionately about how we play and interact with games still doesn’t happen often enough. Looking at how the weekend progressed you could definitely see that there were relationships formed and perhaps a sense of community being built. For myself I was able to meet some great people and had some great ideas started in my head with potential for projects to be created. Overall I think at the end of day two, people left exhausted but energized for more to come. For achieving this in just two years of existence in my opinion is pretty significant. To Mark, Jamie and everyone else involved in Gamer Camp this year congrats and thanks for the good times! In a post I hope to have up sometime tomorrow I’ll take some time to look at some of the key learnings I took away this year. Stay tuned! The latest trend in console gaming as of late has been the use of motion technology. Started by Nintendo with the Wiimote , competitors Microsoft and Sony are set to launch their own iterations this fall of how they plan to allow gamers to interact with games in the months and years to come. 1 year passed from the release of the project Milo video and I didn’t really hear much further about the Kinect until this summer from E3. The thing was that there was no mention of Milo, instead there were announcements of games such as Kinect Adventures and and Kinect Joy Ride. Essentially games aimed towards the casual market that looked like they were taken from the Wii. After being shown such a great tech demo this was hardly anything ground breaking. Another aspect which shaked my confidence a bit in the machine was the discussion from reporter previews making mention of significant play lag when using the Kinect . Would the Kinect not meet its full potential and just turn into a Wii wannabe device? 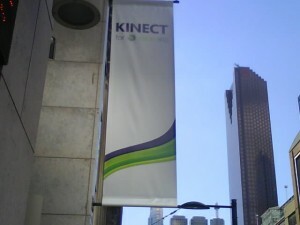 Recently I checked out the Toronto Kinect preview put on by Xbox Canada. Getting to try the system hands on (or hands off really) would finally help me to determine if this was a peripheral that would withstand the lifespan of the Xbox 360 or be eventually discontinued (much like the Xbox HD disc drive). What are my thoughts on the Kinect now having played it? There is some serious tech behind this machine but its still early days. Getting to try most of the game demos on display I had to say except for Kinect Joy Ride the control of the games were very tight and the game play was fun. I wasn’t experiencing any sort of lag and my in game character was mimicking my every move flawlessly. 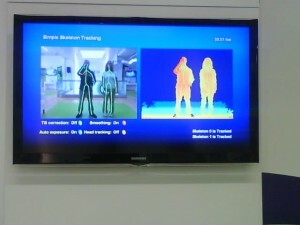 Being shown a device tool (shown in the picture below) you could see that the Kinect was essentially a motion capture machine and more. When showed another Kinect tool I was amazed to see the level of detail in the image it was displaying back to me. In a pixelated view of myself even smaller details like the writing on my sweater were being displayed. More than just motion capture! My concerns for the system? That it will be nothing more than a tool to attract casual gamers pushing out games that contain just short mini contests and family trivia. While it has been confirmed that Fable 3 will have some sort of conectivity and at the Kinnect preview I was assured that they had more in depth games in the works, Microsoft needs to get a few blockbuster quality games on the Kinect for it to be accepted by their primary audience who play games like Halo, God of War and Madden NFL. If they can get games out with similar game play to the commercial below I’d be completely sold! While to a smaller extent, I was also concerned by the demands of the Kinect in terms of how much space and energy it required to play this game. In one demo, I found to be successful in the game I needed to be moving in a floor area that if played in my apartment would place significant demands on my living room space. The games also if played for long periods are definitely a workout ! They aren’t ones you can simply sit down for, they take your whole body and movement into it. As gaming is often something people play to to sit back and unwind, being required to be on their feet and active may be a bit of a put off. Overall I’m converted back into thinking that the Kinect will be a killer app for the Xbox 360. I hope that Microsoft is able to put the marketing push into this device and persuade gamers to purchase it as I know I will! For a while I thought that internet privacy was over. The era of your mom telling you that you shouldn’t talk to strangers and to keep your identity a secret was coming to an end. I kept the mind set that the internet has become just another facet of a person’s identity and that information you post up is similar to being part of a phone book or walking down the street. Recently there have been a few things which made me reflect upon how internet privacy and anonimity on the web still has some importance. Earlier Blizzard Corp makers of World of WarCraft, Diablo and Star Craft announced the implementation of a RealID system which they planned to put into place for the upcoming Star Craft 2 title and later across their entire library of games. The idea behind real ID was that users could interact and be more connected to their friend lists within these games. Blizzard had to later pull back on this initiative because of the massive backlash from their communities and it is now an optional feature rather than being enforced system wide. When everyone has a Facebook account why would gamers be concerned about revealing their personal information in game? Well for some its a sense of escape, it takes them away from their day to day lives as described in an editorial from Daniel Lipscombe titled Why I play games: My Escapism . Gaming is a way to become separate from day to day activities. If you attach your real name to characters in game or within discussion of the game is that separation still there? Also if a character named “Princess Peach” decked out in pink is suddenly attached to a user named Joe Blow can this person still act out the characteristics of that character? (Ok extreme example but you get the point!) Despite all of this openness on social sites such as Facebook, anonimity is still sought in the gaming world because once you form your character you can be a different person than yourself. When that character suddenly has your name it changes that aspect of the game. With the ability to act (almost) completely anonymous online a certain mob mentality can often sink in within a group of like minded users sometimes with negative consequences. Jessi Slaughter AKA Kerligirl13 an 11 year old from the U.S. enjoyed sharing her life and her interests on YouTube like many vloggers. As video views increased on her channel she began to see negative comments and she reacted much like any 11 year old girl would with a reactionary video. This video to haters with the infamous line “I’ll pop a glock in your mouth and make a brain slushy” went viral and attracted the wrong type of attention. So much so that her and her family are now under police protection . A large cause of this problem is a site called 4chan. Now I won’t go into much details about the site or its users (because they scare the hell out of even me…) but as a group they have been known for creating false rumors about Steve Jobs having a heart attack (and causing Apple stock to take a tumble) and rigging the Time Magazine 2008 most influential person poll to be Christopher Poole aka Moot the founder of the site. Essentially this site with its large and anonymous user base is able to cause a lot of trouble when motivated to do so. Upon seeing the video from Jessi ,4chan users decided to take it upon themselves to teach this girl a ‘lesson’ through harassing phone calls and vandalism of social media profiles among other things. While what this little girl has said online is absolutely inappropriate for a girl her age to be saying at all, harassing her and her family is even worse. With the growing ease of finding personal information online it is easy to announymously contact another person and do actions to them to the point of harassment. Kids especially not knowing the expansiveness of the internet and the consequences of being online are now increasingly at risk of receiving abuse online and without fully understanding could be sharing all sorts of personal information with perfect strangers on the web. With younger age groups being at such risk online its very easy to say that they should be protected but the harder thing to answer is how? No matter what restrictions are put in place there will be work arounds. Age restrictions on sites are easily lied to and parental controls are almost easily turned off as well. When others can act anonymously and manipulate your own information how can be protect those who are just learning about the full expanse of the web? In the end I think managing your online self is becoming just as important as managing yourself offline. We all are visible online, its as easy as a quick google search so we need to ensure that only what we want people to see is visible. I think we also have to remember that our anonymous selves aren’t completely anonymous either. 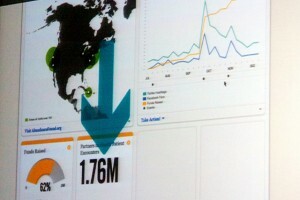 Comments or accounts that you think you made in private can still be potentially tracked back to you. Having these online persona’s bring on new problems like cyber bullying and identity theft and for good and for bad put us in front of a more global audience. For now I’ll remain more careful of what I place online and will continue to watch how things develop. But I Just Want to Be Touched! Computers: HP TouchSmart PC, Microsoft Surface, and coming up the Crunch Pad, ‘Rumored’ Applie itablet, and Microsoft Courier. Laptops have gotten a lot smaller, much more tactile and are getting additional screens for added use. Interactive Gaming: the hold in your hand Nintendo DS, Sony PSP, and the Wii. Upcoming Xbox Natal and PS3’s new motion remote. Even more recently I was interested to hear about how some television manufacturers were beginning to make 3d televisions , this is a drastic shift! Television has often been an inactive activity and now you’re getting placed into your shows! Electronics becoming more tactile and interactive is an interesting shift. Perhaps over the years people have felt a lot more passive and immobile with the use of PC’s and low touch devices. With the improvement of wireless technology’s, smaller devices and a more social internet maybe what we are seeing now are people in general wanting technologies that offer them an experience and further feelings of freedom and attachment. For me thats an important shift to take into account and is something that can be used in terms of business and marketing. Looking at customer experiences ( whether its interactive or passive ) how products are used ( are there ways to let a person know if they are doing this right? How can this product improve their life experience?) and what materials go into these products ( will material X feel better than material Y). This may all seem very rambly…. or it may put things in perfect sense. I don’t know. Its just been something thats been on my mind for while, driving ideas and thoughts. Am I headed in the wrong direction with this or do I have a sense of sanity in these thoughts ? Let me know what you think.